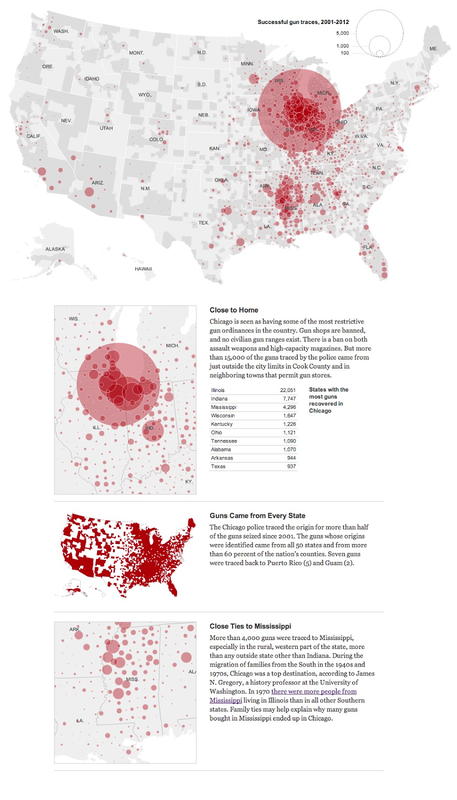 In the last month, as the gun control debate has become the focus of our national attention, Monica Davey of the New York Times has written a couple of important articles about the epidemic of violence on Chicago's South and West Sides. These articles have included excellent supporting graphics. 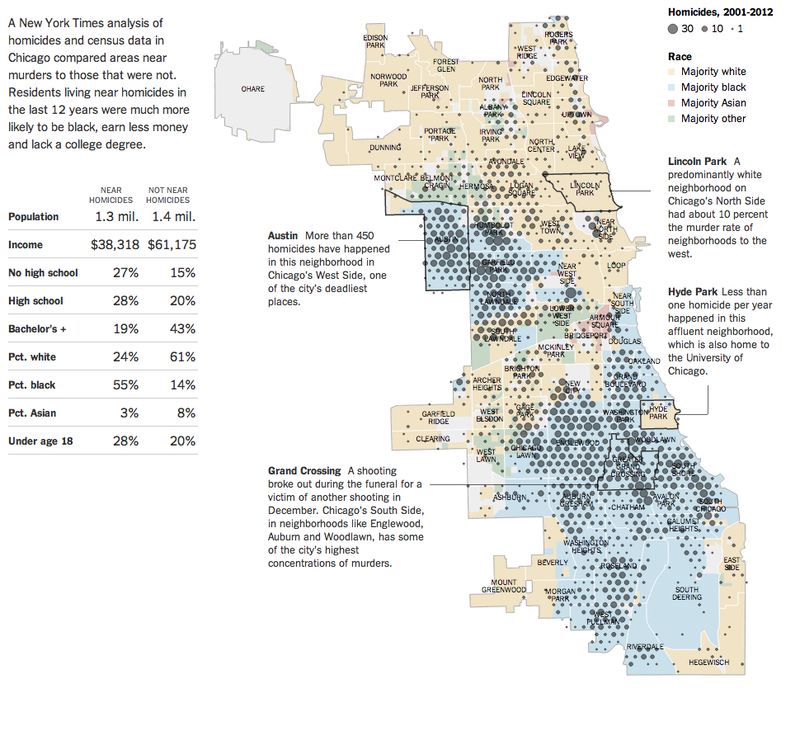 Whet Moser of Chicago Magazine has added a local perspective as well. More than 80 percent of the city’s homicides took place last year in only about half of Chicago’s 23 police districts, largely on the city’s South and West Sides. The police district that includes parts of the business district downtown reported no killings at all. And while at least one police district on the city’s northern edge saw a significant increase in the rate of killings, the total number there still was dwarfed by deaths in districts on the other sides of town, and particularly in certain neighborhoods. Chicago’s experience reveals the complications inherent in carrying out local gun laws around the nation. Less restrictive laws in neighboring communities and states not only make guns easy to obtain nearby, but layers of differing laws — local and state — make it difficult to police violations. This is an extremely complex and frustrating issue. To begin, it should be noted that Chicago does not even crack the list of America's top 25 most violent cities. The City's murder rate is half of what it was twenty years ago. Last year not withstanding, the murder and crime rate has consistently declined since about 1992. There are a lot of reasons for the overall decline in the city's murder rate, including demographic change, gentrification, improved medical technology and improved policing strategies. To put things in perspective, deaths by automobile accidents and suicide both outnumber death by murder in the United States by a rate of more than 2 to 1. Last year 32,310 people died by car accident, the lowest since 1949. By contrast there are around 13,000 murders a year in the United States. Nevertheless, Chicago's murder rate remains significantly higher than what we would like to consider our "peer" national and global cities - places like New York, Los Angeles, San Francisco, etc. The murder of Hadiya Pendleton a mile from President Barack Obama's Kenwood residence has personified the tragedy and self-destruction that the City's gang violence has caused. "Part of Lemann's thesis, not that he ignores the effects of segregation and concentrated poverty, is that the divide between city and backcountry was also brought north: "Every aspect of the underclass culture in the ghettos is directly traceable to roots in the South -- and not the South of slavery but the South of a generation ago."